If you've been here before, you know I enjoy tablescapes and sometimes share them here. 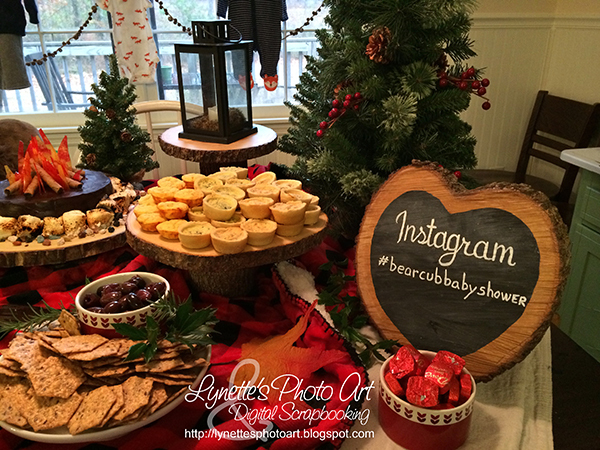 I just realized that I never shared the biggest one of all - my daughter's Lumberjack Baby Shower! What a lovely event that was! Wood and plaid - galvanized steel and pine - fall leaves and fur trimmed blanket - twine, rusty bells, burlap and clothespins - red, black, brown, metal and stuffed wildlife! The whole idea of a "lumberjack baby shower" really took me off guard, as the sweet little onesie pinata cookies filled with baby color-reveal candies that I've dreamed of for years filled my head. I had never heard of such. They are all about hiking in the mountains. I was so surprised to find that the lumberjack baby shower is a "thing". So, shifting gears, this is what she, her sister and I came up with and wow was it a hit! And yes, I believe in the guest of honor getting to participate and get what they want, if they choose to. The collaboration ended up being the very best part for me! When we bought our house, there was nothing in the back yard. We spent years planting an amazing garden that would cause people to glorify God when they saw it. Many years later ... a year or so ago, the gorgeous Bradford Pear we had planted split, then the rest fell a couple of weeks later. It hit our beloved Weeping Cherry as it fell. The Cherry died from the damage. Determined to bring good from this tragic loss, I begged those disposing of them to please, please, please try to cut slabs and chunks (for risers) for me. 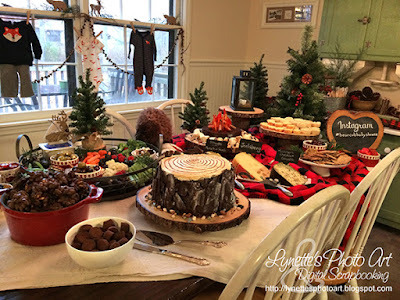 I had adored the wood slab movement in tablescapes for ages and now it would be perfect, slabs from my own beloved trees. Well, doing it with a chain saw is a lot harder than you'd think. I carefully dried them, such as they were, but in time almost all of them split, as well as being uneven and rough cuts. 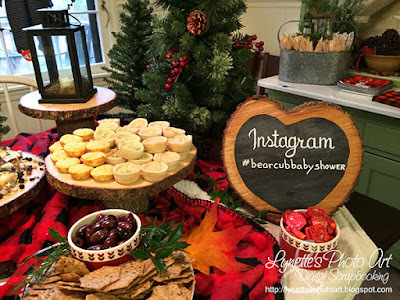 With the theme she wanted for the shower, using them would be too perfect. I managed to make some of the chunks even enough to use as pedestal risers, and bought several flat slabs from Home Goods to sit on them. The heart shaped one actually came from our Bradford. We were delighted to find that where a branch came off the main trunk, the slices came out hearts! She had wanted a wood slice painted with chalkboard paint for the shower and later to hang it in the nursery - how perfect would a heart be! 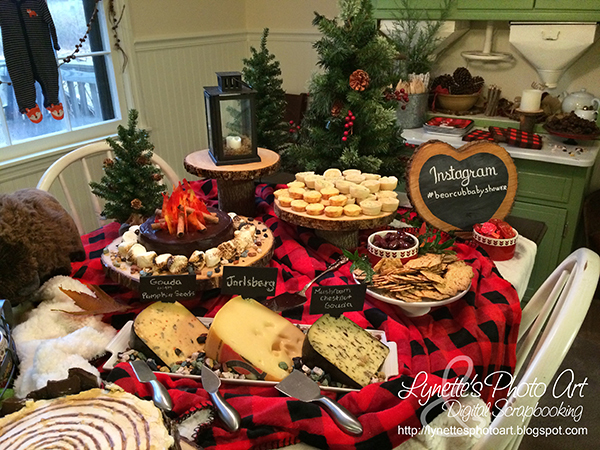 All the natural wood really worked well with the theme. By the way, the furry brown shape on the left is a buffalo. Her sister bought her a collection of stuffed wildlife from the Smoky Mountain National Park gift shop as a baby gift. Again, perfect for our theme, so we used them! 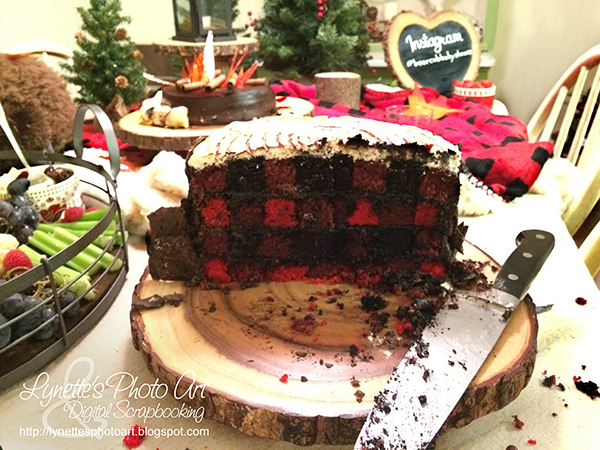 I adore this campfire cake! I saw the idea on line, of course! We used a small Boston Cream Pie on a wood slab. My sister and oldest daughter roasted the marshmallows with a kitchen torch. 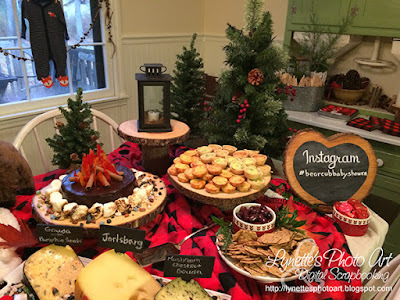 The "rocks" around it, and scattered in other places with the food, were chocolates made to look like rocks that her sister found on line. Love them! So real! The logs are a cookie from Walmart. The flames are red and yellow hard candies, again from Walmart, that we broke and then melted in the oven on foil and broke into shards. My sister and my oldest assembled it all into this perrrrrfect confection! Oh when light shines through the "flames", they glow red and yellow! 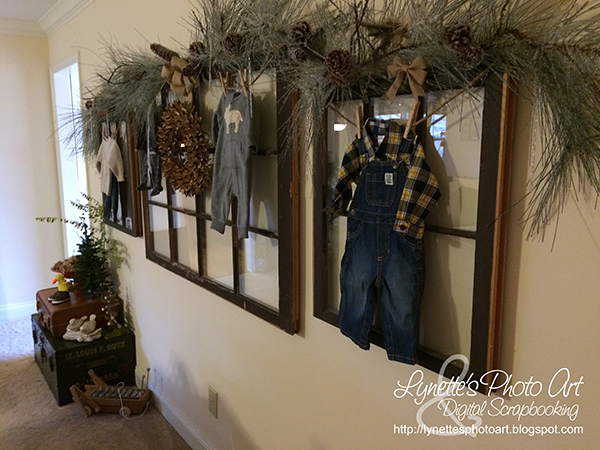 Along the windows we hung heavy twine as a clothes line and clothes pinned some of baby's gift clothes on it. We swagged another twine with rusted bells on them below. On top you can see adorable moose, deer and bears made of heavy corrugated cardboard with twine, bells and a soft touch of glitter. They were sold at Hobby Lobby as ornaments - perfect! Of course that's where all the little trees came from too. We used off white flameless candles in the lanterns and scattered about the house. 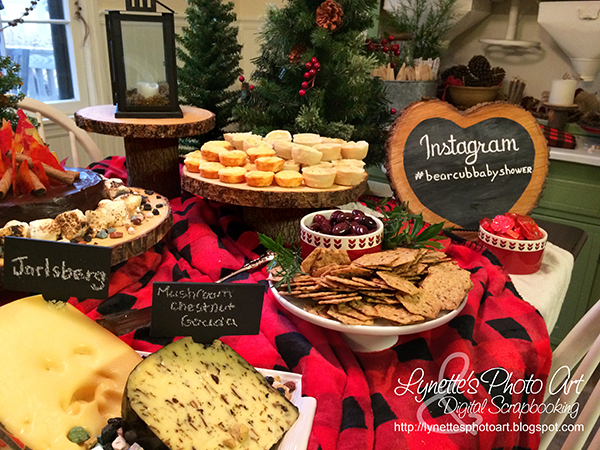 The pretty round red and print dishes were from Home Goods - the store of ingredients for happy times! We hung gift outfits throughout the house, some on Command Strips. I had not used them before, but they worked great and didn't leave a mark! Another perrrrfect! The fur lined velvety blanket was from Hobby Lobby. We put it on top a canvas drop cloth, making sure some canvas showed. The slate chalkboard cheese markers and silver cheese knives were from a set at Sam's Club that included a slate turntable. 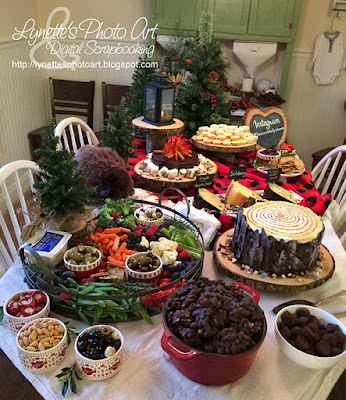 Mini quiches from Sam's, gourmet olives, multi-grain crackers and heart shaped foil covered chocolates top colorful fall leaves. My oldest daughter found these amazing twig pencils, bamboo flatware, awesome rustic looking thermal cups and straws that look like birch bark on line. All in keeping with wild nature. The pencils were for games. The galvanized bottle holder, from Home Goods, dispensed the awesome flatware and straws with cuttings from my yard in the back. The twine garland with rusty bells, plates and napkins were from Hobby Lobby. The pine cones are ones I collected from the track we use, with red ribbon to make them pop. More chocolate rocks and a plate of handmade chocolates. 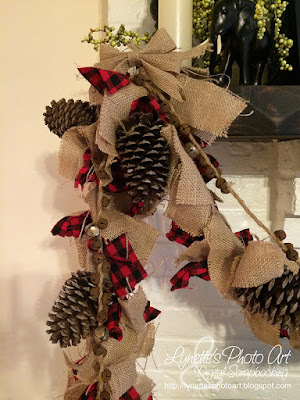 Burlap and plaid garland with cardboard deer. 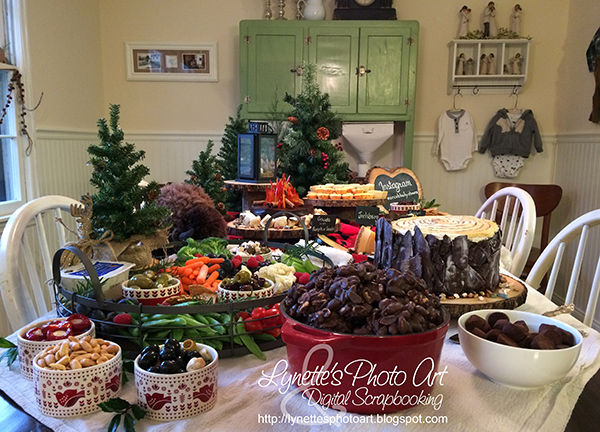 We were so blessed to be doing this theme in December. We had first pick of all the gorgeous decorations at Hobby Lobby! 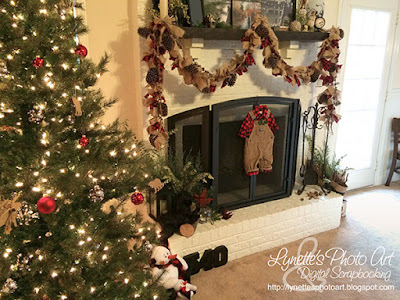 I bought all of this garland in both stores in our area and added their twine garland with rusty bells and my pine cones. Each swag was topped with a burlap bow from, yep, Hobby Lobby! Love how they turned out! We used them all over the house. The house it was held at was so perfect for this decor. You can see some of the cardboard animal ornaments on the tree...with simple white lites and a few red balls to coordinate. There is a stuffed black bear on a log (from our tree) on the hearth. Pods and acorns we collected were strewn on the hearth and other places. Clippings from my yard are behind the bear, in the wood box at the far end, on the mantle and sprinkled all over the house too. No need to provide water. They held up fine till the end. 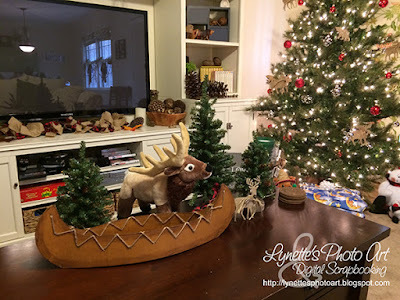 More magic from Hobby Lobby and an exquisite stuffed moose from her big sister on the coffee table. 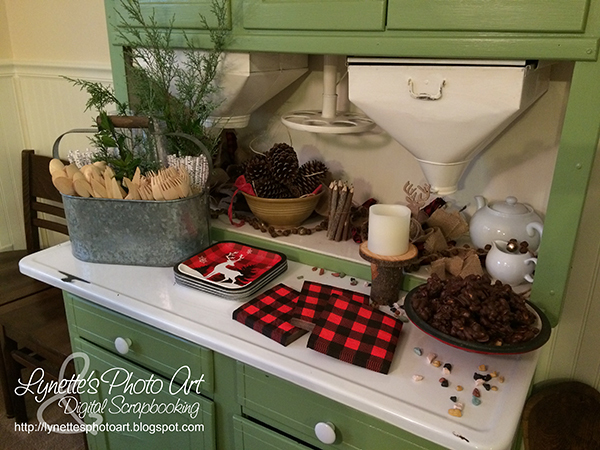 We scattered more garland, pine cones and dried pods on the wall unit and around the house. The old windows were saved from my house and the trunk you see was my father's WWII footlocker. The wreath is one I made of cotton bolls. I posted about them here. 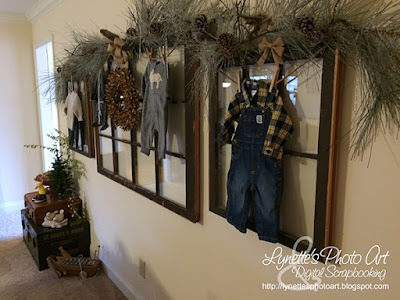 Baby clothes were hung from twine clothes line with greens and pine cones everywhere, sprinkled with burlap bows. This is sad for me. I was sooooo busy at the party that I didn't get a good picture of the cut cake. It was the BIG project and soooooo much work for the three of us, figuring out how to do it and then doing it. I could cry that we didn't get a good picture of it cut. Here is what we have. I am glad I was paying attention to the reason for the party more than the "details". It really was pretty amazing. 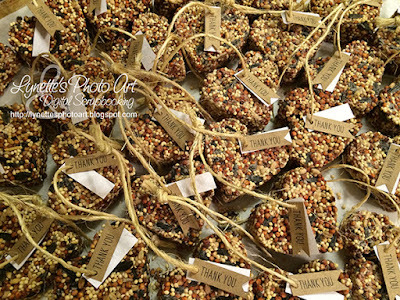 I made chunky birdseed hearts as thank you gifts. They turned out very cute indeed! The best part for me was getting to Face Time her at Hobby Lobby, from another state, and let her pick things herself. All three of us shared a Pinterest album, screen shots and links from the web of things she wanted and then I got to make them. I LOVE making things! I can't tell you how wonderful the collaboration was! The three of us working together from two states and three cities, wonderful! So many texts and phone calls - such fun! I got to make the plaid tree stump cake with both my girls, and my sister, from yet a fourth state and oldest daughter assembled the campfire s'more cake. I think every party should be done this way!!! So much more fun! Thanks for dropping by! Have a wonderful day!